The global commercial refrigeration equipment market has been accumulating lucrative opportunities with the increasing rate of international food trade over the past years. Commercial refrigeration equipment is largely used in the transportation of extremely perishable foods and beverages, promising the market of an improving growth rate. Food as the number one human need in all parts of the world is anticipated to remain as a strong growth factor for the global commercial refrigeration equipment market. For instance, China, Indonesia, and India have been at the forefront of increasing the production rates of seafood, whereas Peru has been a leader in aquaculture activities. There are some interesting figures to take into consideration if you are a player operating in the global commercial refrigeration equipment market. Analysts foresee the market to be valued at a US$66.88 bn by the end of 2022 after progressing from a US$39.44 bn earned in 2016. During the forecast tenure 2015-2022, the market could expand at a 9.1% CAGR. Researchers authoring the report segment the world commercial refrigeration equipment market as per application and product with different segments taken into account. On the basis of application, you could find some or the other prospects in four key segments, viz. food and beverage production, food and beverage distribution, food and beverage retail, and food service. However, analysts foretell the world commercial refrigeration equipment market to be largely benefited with the leading rise of food service anticipated to secure a king’s share until the end of the forecast tenure. The food and beverage industry could witness an escalation in the demand for commercial refrigeration equipment due to the improvement of cascade refrigeration systems installed with variable speed compressors. By product, the world commercial refrigeration equipment market has been classified into commercial refrigeration equipment parts, beverage refrigerators, refrigerators and freezers, transportation refrigeration equipment, and other equipment. The last classification in the list could include equipment such as egg refrigerators, dairy coolers, compressor racks, liquid chillers, cryogenic equipment, refrigerated vending machines, ice machines, and display cases. Out of the above segments, transportation refrigeration equipment is predicted to demonstrate a faster growth in the coming years. This segment could be favored for growth on account of the rise in international food trade with trade liberalization and globalization in agriculture. The growth of the international commercial refrigeration equipment market is envisaged to remain dominant in Asia Pacific as the region holds a leading position in the global food industry. The demand for food has been growing at a brisk rate in the region on the back of the speedy progress of emerging economies therein. International horticulture and food trading could see the achievement of a higher rate owing to enhanced consumer trends based on rising disposable income. It is important for players to note that this region is envisioned to attain a valuation of US$29.06 bn by the final forecast year. Nevertheless, developed regions are also projected to significantly contribute to the international commercial refrigeration equipment market. For instance, North America could make its presence known in the market while riding on a vast consumption of foods that require commercial refrigeration. However, concerned players may look into the latest changes brought about by North American governments, especially the U.S., regarding the deployment of greener, modern refrigeration systems while replacing older units. The report also provides a regional study of other important markets, viz. Latin America, the Middle East and Africa, and Europe. Besides this, it analyzes the competitive landscape while profiling key players such as Dover Corporation, United Technologies Corporation – Unit (Carrier), and Daikin Industries, Ltd.
Commercial refrigeration equipment are refrigerators with remote or self-contained condensing units. These refrigerators are designed especially for commercial use with a wide range of temperature control (typically from -18°C to +10°C). Commercial refrigerators are largely used for food and beverage storage and merchandising purposes. Commercial refrigeration equipment is expected to witness strong demand globally, especially due to growing frozen and processed food consumption. Commercial refrigeration equipment is commonly used at convenience stores, grocery stores, supermarkets, restaurants specialty food stores, cafeterias, and other food retail stores. This research report provides a detailed analysis of trends in the commercial refrigeration equipment market. It also comprises a broad analysis of the industry drivers, restraints, and opportunities. The report also provides a comprehensive assessment of manufacturers’ strategies. The market for commercial refrigeration equipment has been segmented into its various applications: food service, food and beverages retail, food and beverages distribution, food and beverages production, and others. Food service is expected to be the largest commercial refrigeration equipment application over the forecast period. 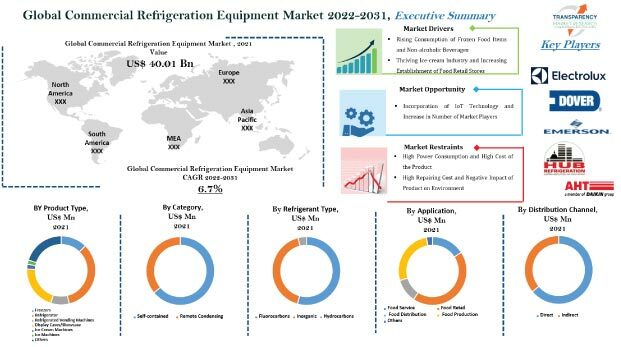 The global commercial refrigeration equipment market has been extensively analyzed on the basis of product types into transportation refrigeration equipment, refrigerators and freezers, beverages refrigerators, refrigerator parts, and other equipment. Transportation refrigeration equipment is expected to be the fastest-growing commercial refrigeration equipment product segment over the forecast period. Other equipment in this market are display cases, ice machines, refrigerated vending machines, cryogenic equipment, liquid chillers, compressor racks, dairy coolers, and egg refrigerators. The market size and forecasts in terms of revenue (US$ Mn) for each of these segments have been provided for the period 2012 to 2022, considering 2013 and 2014 as the base years. The report also provides the compounded annual growth rate (CAGR) for each segment of the market for the forecast period 2015 to 2022. The commercial refrigeration market is segmented based on geography into North America, Europe, Middle-East and Africa, Asia Pacific, and Latin America, and a detailed regional analysis is provided. A country-level analysis is also included in the report, covering the countries in each region. A separate analysis for the commercial refrigeration equipment market in Mexico is provided in the report. Asia Pacific is expected to be the largest and fastest-growing commercial refrigeration equipment market among all regions. The market estimates for the commercial refrigeration equipment market have been assessed considering different political, environmental, social, technological, economic, and legal factors. The market share of the leading players for the global commercial refrigeration equipment market is estimated for the year 2014. Company profiles (CPs) of market leaders elucidate on details such as a company overview, segmentation, recent developments, business strategies, and financial information in the commercial refrigeration equipment market. Companies profiled in the report include Daikin Industries, Ltd., Whirlpool Corporation, Danfoss A/S, United Technologies Corporation – Unit (Carrier), Dover Corporation, Illinois Tool Works Inc., Hussmann Corporation, Ingersoll Rand Plc, Haier, Inc. (Haier Group), Metalfrio Solutions SA, Beverage-Air Corporation (Ali S.p.A), and Electrolux AB. The report would allow commercial refrigeration equipment manufacturers, lawmakers, large retailers, and research and development agencies to make informed decisions about commercial refrigeration equipment manufacturing, designing, marketing, growth strategies, and thus gain competitive advantage in the market.